This year I was again honored to be asked to coordinate a special showcase of my top picks in cat products at the annual BlogPaws pet blogging and social media conference, one of my favorite events. The conference draws pet bloggers, social media experts, and pet product brands from across the country, bringing everyone together for three days of networking, education, and lots of fun. 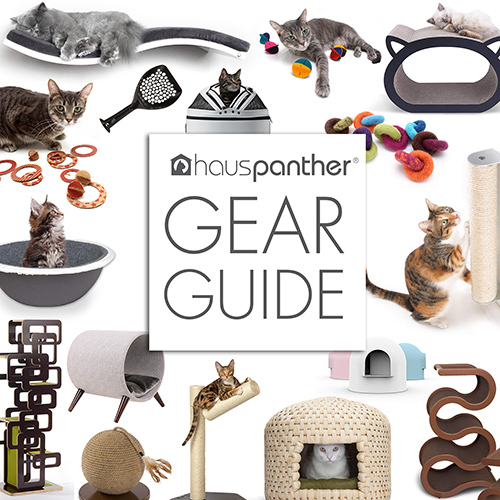 The Hauspanther Cat Style Lounge is a special area where feline-focused attendees can hangout and interact with some of the coolest new cat gear. Our Catwalk sponsors included Pioneer Pet, Catit, Petmate featuring the new Jackson Galaxy Cat Product Collection, ShopMeoow.com, Sleepypod, Katio, Vesper, Pet Tree Houses, and CatastrophiCreations. All of their displays were spectacular and filled with fabulous products. Other sponsors included 26 Bars & a Band, AVP Pet, Automated Pet Care Products, Cattino, Catty Stacks, Feline Yogi, Groom Genie, K-Kat Innovative Pet Products, Kascade Designs, PawNosh, Peach Industries, Pet Fusion, PurrfecTrends, The Cat Ball, Triple T Studios, and Kitty Kush Catnip. New cardboard cat scratcher from France! And of course we had another cat craft party in the lounge during cocktail hour on the first night of the conference. The craft party was a huge hit last year when we made DIY cat ears, so I had to do it again. This time everyone made their own cat eyeglasses and everyone had a blast! Thank you to the amazing team at BlogPaws for putting on this wonderful conference. Wait until you see what we have planned for next year, because the conference will be in my hometown — PHOENIX! Enter to Win a Petaggio Custom Wood Pet Portrait from Davies Decor! Big Savings on Hollywood Franklin Cat Tower DIY Kits! The Cat Lounge was PAWSOME! Thanks so much for all you and the sponsors did to get it together and make it so good! Looks like a caterwaulin’ great time! It was pawsitively an honor to sponsor the CatLounge at BlogPaws! Looks like everyone had a great time! Thanks for all the great work Kate! !